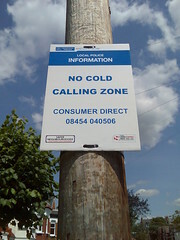 I love it, "No Cold Calling Zone!" If people approach you on social media sites about promoting their blog, service, or product do you do it? Or…do you only promote, share, and retweet those things that are worthy in YOUR opinion? And if you are selective…how do you tell someone no? Tough question, and I’m not sure how many people would be honest about it. I for one do not approach people to share anything of mine because I don’t want to put them in an uncomfortable situation…that’s not my job here on Earth. Instead, I would rather someone promote, share, or retweet me because they find what I do generally, or something I did specifically, valuable to them. I guess that’s the aspect of this that most intrigues me, that there are so many people running all over social media sites bugging people to retweet or share their crap. And when I say crap here, I mean good or bad…I’m speaking more to the fact that people have the balls to do that. Stop cold calling me, stop ringing my social media doorbell and talking to me about your religion and trying to convert me…sheesh! Most people do not like the hard sell, in fact, I’d venture to say nobody does…sometimes the hard sell works because people will bite just to get you to shut up and leave them alone. Very few hard sellers can sustain success over time…the hard sell pushes people away verse pulling them in. My advice…observe how you are interacting with others and how they in turn are interacting with you…if you’re aware enough you should be able to see if people are coming to you versus running like hell from you. Tips to pull people toward you: be a friend, listen, engage, create a valuable service or product, help, don’t always talk business, don’t be positive, produce quality content, and most of all…be you. We ALL want you to be you…and in return I hope you let me be me. Amen Matthew! I’m surprised you didn’t mention though the communities that exist where groups of people RT each other’s blogs to promote then. What are your thoughts on these? Cheri…I believe in ONLY promoting the stuff you actually like…don’t promote for the sake of promoting. The idea that I would promote something I don’t like in the hopes someone would than promote me, seems fake and shady…just my thoughts. You? I agree. And I know some pretty often RTed bloggers that do this because I either follow or have followed their blog(s)! You might be surprised some of the names…but they do get a lot of RTs. Cheri…sorry I spaced on responding. This goes back to the questions about “gaming” the system…is it “fair” to RT stuff simply for the sake of RT’ing? As much as I’d love to do that to build higher rankings, I feel it’s wrong…you know?? Kind of a tough question…greed vs. honesty?? I don’t know.